The World Championships, Chelyabinsk 2014, moved towards the conclusion of the individual competition as three champions emerged at the Traktor Sport Arena on Friday. The women’s -70kg and -78kg judoka took to the tatami along with the men’s –90kg judoka with an expectant Russian crowd sensing more home medals in Chelyabinsk. The three world titles went to Colombia, Brazil and Greece as a global audience once again saw how judo is one of the world’s most practiced sports at the grassroots and elite level. Hosts Russia have been on the medal podium every day to the immense pleasure of the home fans but a gold medal still eludes them and they will hope their fortunes can change on Friday. The Traktor Sport Arena attracted a full crowd once again including sporting idols such as mixed martial arts legend and former Russian judo national team member Fedor EMELIANENKO (RUS). EMELIANENKO, who won bronze at the 1999 Moscow tournament before it later became the Moscow Grand Slam, started his sporting career in judo and is a regular guest at IJF World Judo Tour events. 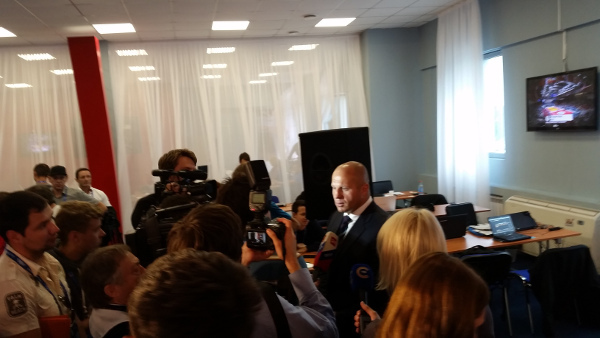 EMELIANENKO had high praise for the crown jewel of the Tour and spoke fondly of the host city of Chelyabinsk. The 37-year-old said: “I have a great impression of the World Championships here in Chelyabinsk on my first day at the competition. I’m happy to see so many countries, athletes and supporters here and I’m pleased that everyone seems to be enjoying the event. “I am full of pride for Russia for hosting such an important and spectacular event and especially as I used to be a judoka for Russia. I have fought for the honour of Russia and I know what the team is experiencing here. I know the Olympic champion Tagir KHAIBULAEV very well and I ask you all to shout for him on Saturday. “This is a key event for all judoka in their preparations and qualification for the Rio 2016 Olympic Games and I look forward to more judo in the coming days," added the SportAccord World Combat Games 2013 sambo ambassador. After five days of competition, Japan are still top of the medal table with four gold, one silver and two bronze medals ahead of France and Georgia. The final day of the individual competition takes centre stage on Saturday and features the men’s -100kg and +100kg categories and women’s +78kg category. Olympic and six-time senior world heavyweight champion Teddy RINER (FRA) will be chasing a seventh crown which would equal the record of world title wins set by TONG Wen (CHN) and IJF Hall of Famer TANI Ryoko (JPN). 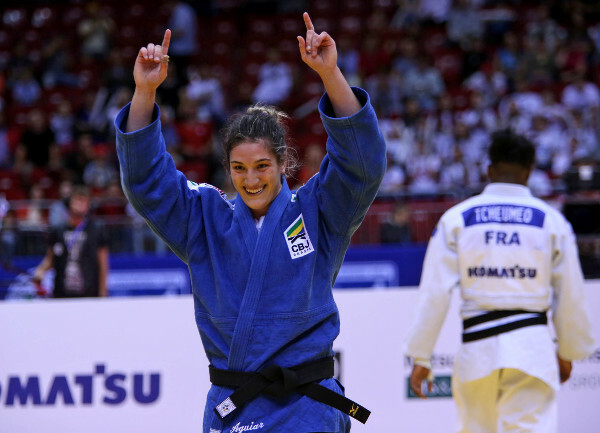 World champion and Olympic bronze medallist Yuri ALVEAR (COL) was unbeatable in 2009, 2013 and today as she became the third judoka to retain their title at the IJF’s marquee event. ALVEAR was overlooked in some parts coming into the competition but made a mockery of anyone who dismissed her as he concluded her day and third world victory by beating All Japan Championships winner NUNIRA Karen (JPN). 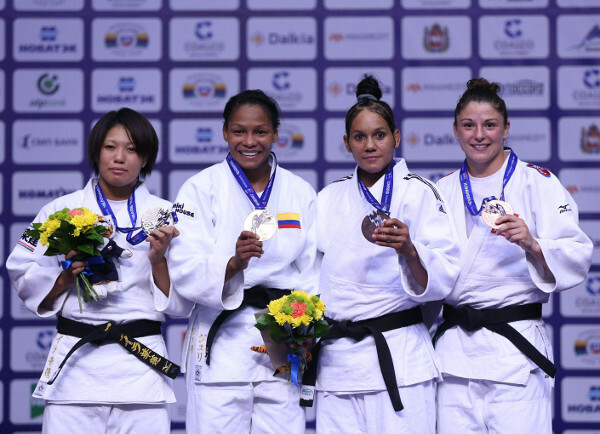 The heartbeat of Colombian judo topped the medal podium after defeating NUNIRA by ippon from a ko-uchi-gake after just 61 seconds. ALVEAR sat on her knees on the tatam after she was awarded the win and looked up to as if to praise some divine inspiration. In the first semi-final ALVEAR surprised world number one Kim POLLING (NED) who was well beaten in the end. POLLING, who just did enough in the preliminaries to reach the last four, was caught for a waza-ari in the second minute and then an osoto-gari added a yuko for the Colombian. The defending champion produced another waza-ari score to progress into the -70kg final. In the second semi-final NUNIRA conquered Junior world champion Barbara MATIC (CRO) who has made the step up to the senior stage with ease. MATIC, who won bronze at the European Championships in April, was undone on the ground as NUNIRA submitted the 19-year-old with a juji-gatame. The first bronze medal was won by Onix CORTES ALDAMA (CUB) who abruptly ended the medal ambitions of her teenage opponent from Croatia. CORTES ALDAMA threw MATIC with uchi-mata for ippon to win her country’s second medal of the competition after Maria Celia LABORDE (CUB) took -48kg bronze on Monday. The second bronze medal was won by Baku Grand Slam bronze medallist Katarzyna KLYS (POL) who handed POLLING a second successive humbling defeat. KLYS stepped over a uchi-mata attack and took the lead with a yuko before scoring waza-ari with a ko-uchi-gari as her Dutch rival ran out of ideas. 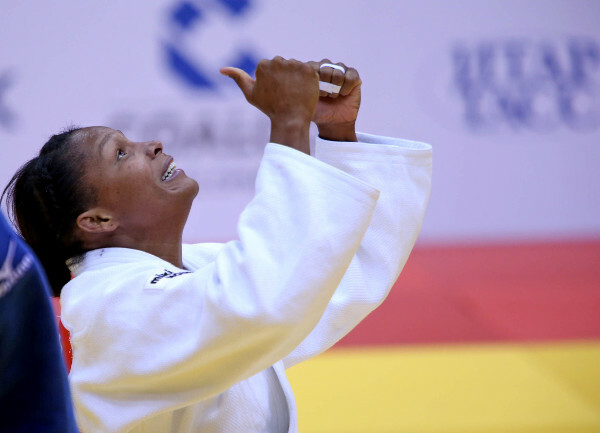 Olympic and world bronze medallist Mayra AGUIAR (BRA) won her first world title with a ruthless performance having previously earned one silver and two bronze medals at the annual judo showpiece. AGUIAR, 23, defeated former world champion and fellow Olympic bronze medallist Audrey TCHEUMEO (FRA) in the -78kg final. The Brazilian ace, who only returned from a year-long absence through injury by winning the Tyumen Grand Slam in July, was in inspired form as she opened the scoring with a waza-ari from a low uchi-mata. Brazil, who only had a slender return of a -52kg bronze medal from Erika MIRANDA before today, were reinvigorated by AGUIAR who was lifted up off the ground by her ecstatic coach Rosicleia CAMPOS as teammate Maria PORTELA (BRA) was shown jumping for joy in the crowd. In the first semi-final TCHEUMEO guaranteed a new world champion by ousting 2013 winner SOL Kyong (PRK) in 82 seconds with a harai-goshi. 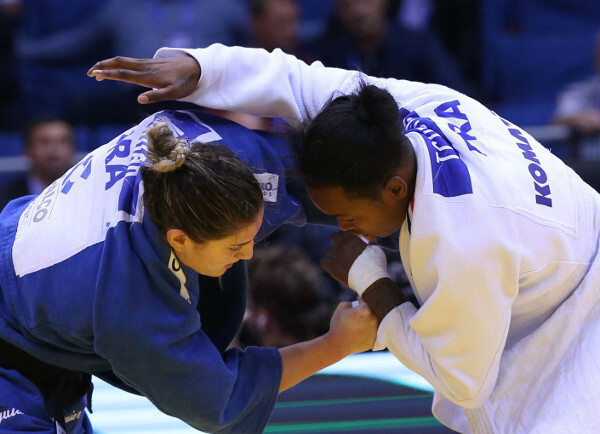 In the second semi-final AGUIAR defeated Olympic champion Kayla HARRISON (USA) who returned from injury in June as she won the Havana Grand Prix, the first IJF competition to carry points towards qualifying for the Rio 2016 Olympic Games. AGUIAR went ahead with a yuko and added a waza-ari to her opening score as HARRISON. The first bronze medal was won by HARRISON who saw off former European Championships bronze medallist Yahima RAMIREZ (POR) by the narrowest of margins. 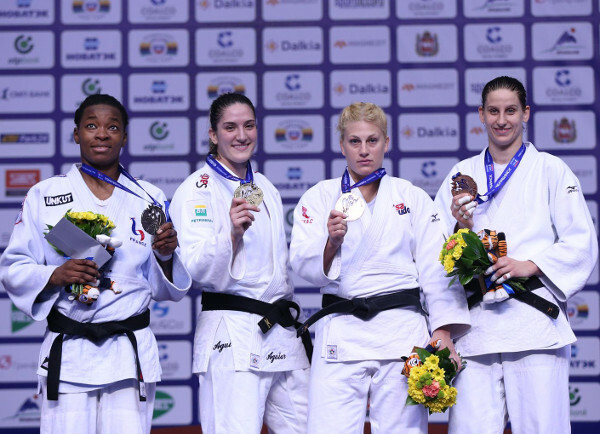 RAMIREZ was penalised with a shido in a scoreless contest which marked the return of HARRISON to World Championships podium and her country’s first medal in Chelyabinsk. The second bronze medal was won by the vastly underrated Paris Grand Slam winner Anamari VELENSEK (SLO) who defeated SOL who was unable to recapture the form which saw her dumbfound fans the world around when she took gold a year ago. A yuko for VELENSEK was the difference as SOL lacked vigour and failed to trouble the scoreboard. Athens 2004 Olympic champion Ilias ILADIS (GRE) won the third World Championship gold medal of his illustrious career in Chelyabinsk. The world-renowned ILIADIS, 27, has starred on the circuit for a decade and after today’s victory is now determined to fight on to the Rio 2016 Olympics. ILIADIS met one of the brightest young talents in the sport in the final as 20-year-old Krisztian TOTH (HUN) put forward a herculean effort on the tatami. 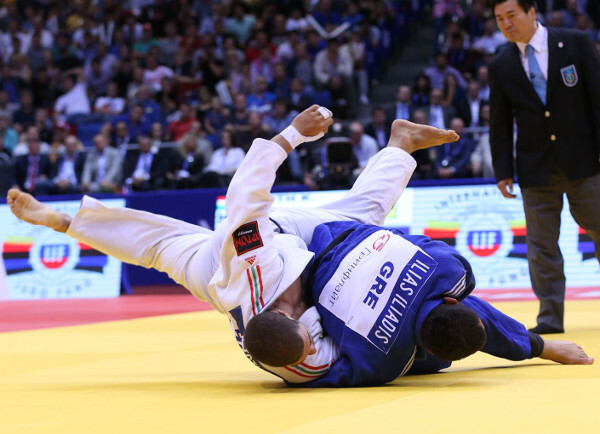 ILIADIS triumphed by ippon as he attacked with osoto-gari and wrapped his arm over the top of his opponents right shoulder for a soto-makikomi and yet another world title. ILIADIS ran around the tatami with three fingers raised on each hand to show his number of his world title wins before embracing with TOTH who showed his respect for his idol by raising the hand of ILIADIS and turning to all four sides of the venue. TOTH said: “It’s really a big surprise for me to be in the final and to be in the final with my idol, Ilias LIADIS. He’s a role model for me. I was probably not expected to medal at this level but it was my day and my dream came true. For the moment, I was ready for the preliminaries and the semi-final where I had a terrific fight. But I was not ready for the final, not yet ." In the first semi-final TOTH sensationally defeated Kirill VOPROSOV (RUS) in an absorbing contest during golden score. Both men went toe-to-toe for five minutes and neither could produce a score as the Russian fans tried to energise VOPROSOV as they raised their volume for the raised stakes of the contest. TOTH silenced the crowd by scoring a match-winning yuko after 53 seconds and clapped the crowd to recognise their excitement for the contest and knowledge of judo. 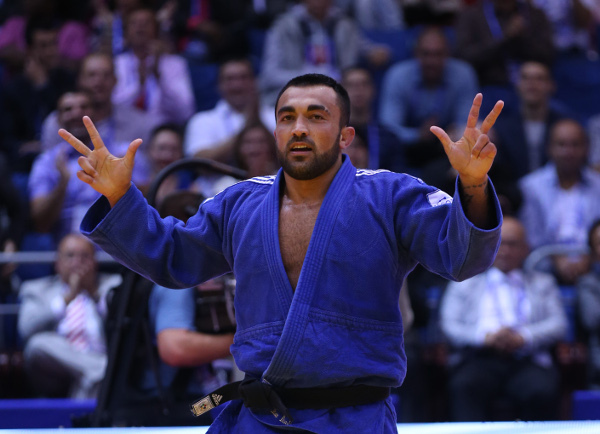 In the second semi-final ILIADIS downed Tashkent Grand Prix winner Sherali JURAEV (UZB) with a display of brute force that makes his one of the most popular judoka in the world. ILIADIS threw with o-goshi for a yuko and went on to the final. 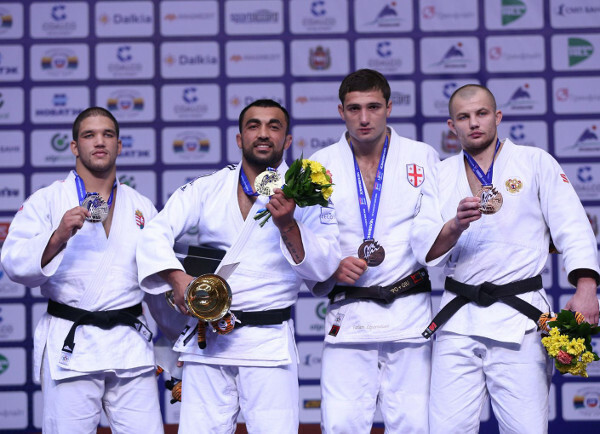 The first bronze medal was won by world number one Varlam LIPARTELIANI (GEO) who was tipped for glory in Russia but had to settle for bronze as his world title dream is on hold for another year. Rio 2013 runner-up LIPARTELIANI threw JURAEV with tsurikomi-goshi for ippon and left the tatami with his left arm over his eyes. The second bronze medal was won by VOPROSOV as compatriot and Chelyabinsk’s own reigning world bronze medallist Kirill DENISOV (RUS) was unable to compete due to injury.